As New Zealand prepares to finish its time on the UN Security Council, Foreign Minister Murray McCully will be remembered for his complicity in making it illegal for Jews to pray at their holiest site, the Western Wall. 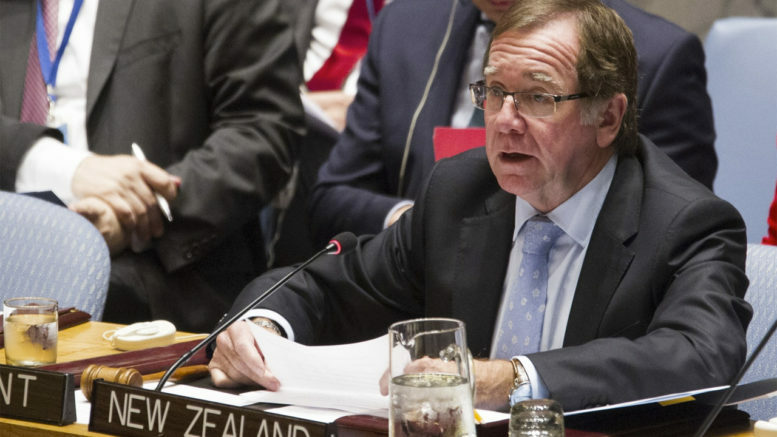 In the last United Nations Security Council meeting of the year and the very last meeting in New Zealand’s two year term as a member, New Zealand’s Foreign Minister, Murray McCully achieved the goal he has so doggedly pursued. Resolution 2334, regarding the “Middle East Peace Process”, was adopted with 14 votes in favour and an abstention from USA. New Zealand co-sponsored the text, which was prepared by Egypt in co-operation with the Palestinians. While Egypt was persuaded to withdraw the text, New Zealand snuck it in opaquely and under urgency the next day in the final meeting of the year, on the eve of both Christmas and Hanukkah. The resolution was co-sponsored by Malaysia, Venezuela and Senegal and has been welcomed by Hamas and Islamic Jihad. That is the company New Zealand apparently now keeps in geopolitical matters. Among other things, the resolution condemns the construction and expansion of all settlements, calls for significant steps to “reverse negative trends on the ground”, states that the establishment of settlements in “the Palestinian territory occupied since 1967, including East Jerusalem” is illegal, underlines that it will not recognise any changes to the 1967 lines including regarding Jerusalem except as negotiated by the parties, and calls upon states to distinguish between Israel and the occupied territories in their relevant dealings. It also calls for an end to terror and incitement. As renowned constitutional and criminal lawyer and Harvard scholar Alan Dershowitz notes, “It is now illegal for Jews to pray at the Western Wall, live in certain Jewish neighborhoods in Jerusalem or attend Hebrew University on Mt. Scopus.” It is a further denial of the Jewish connection to its holiest site. It also entrenches BDS – the isolation and boycott of Israel. And it apparently enshrines a brand new principle of international law – that the victor in a defensive war (in this case against Jordan) has no right or claim to the land it acquires and must hand it back – but to someone else entirely (the Palestinians who at the time of the war had no governing body nor sought autonomy). Make no mistake, this resolution may be dressed up in new clothes, but it is a further insidious delegitimisation of the Jewish state by the UN. It was no surprise that Obama would use the final days of his presidency to depart from the regular practice of the USA vetoing anti-Israel resolutions. The relationship between President Obama and Prime Minister Netanyahu had been fraught from the beginning. This was Obama giving Netanyahu the finger as he walked out the door. The hypocrisy of Obama’s position was underlined by the impassioned speech of his ambassador, decrying UN bias against Israel, while at the same time awarding that bias yet another victory. There are many unresolved questions about McCully, who came into the UNSC vote with a string of diplomatic blunders under his belt – the penultimate of which was immoral and misled Parliament, cabinet, the public, and the media according to Labour MP David Parker. Shalom.Kiwi was told that McCully did not seek cabinet approval for the recent UNSC vote – why not? Did NZ’s new Prime Minister, less than 2 weeks in the job, know what was going on? Was McCully acting as a lone wolf in (Saudi) sheep’s clothing? Does McCully fully understand the implications (for Israel and the Palestinian people, as well as how he will be recorded in history books), of what he pushed for? Was this vote in any way linked to deals that helped McCully get the UNSC seat or to any possible trade deals? Whatever one thinks of the settlements, the UN, with its entrenched bias against Israel just last week acknowledged by Ban-Ki Moon, its incompetence, hypocrisy and corruption, is not the forum to solve this intractable conflict. It will not be resolved by outside bodies imposing obligations on Israel, and even more so without requiring reciprocal obligations from the Palestinians. This is a resolution which is not aligned with New Zealand’s values or in our long-term interests and is not in the interests of peace. Israel has consistently shown a willingness to compromise and make peace when there is a committed partner with which to negotiate. She disbanded settlements and withdrew from Gaza, only to be met with increased violence and a barrage of continuing rockets, and has expressed a readiness to deal directly and negotiate with Palestinians. This resolution perpetuates the falsehood that the relatively limited building of housing settlements in the West Bank is at the root of Palestinian grievances. Quite how the tactic of censuring one side and bolstering the other with false hope is supposed to encourage both parties to the negotiating table is puzzling. What incentive is there now for the Palestinians to negotiate when the outcome of those negotiations has been predetermined? How can they accept less than what this resolution says is already theirs? Why should they give up the terrorism that has been so richly rewarded? All McCully has achieved is further entrenching both sides in irreconcilable positions. Well played McCully, you can be proud of your scorched-earth legacy.